This phase control circuit can be used for controlling the power supplied to an AC load. AC waveform is controlled by the phase control circuit, cutting cycle to provide full cycle, half cycle, the cycle to zero, or somewhere in between. Maybe you can tell which is very similar to an dimmer circuit, but switching and zero crossing of the waveform is synchronized. Triacs not to suffer power losses, thus increasing overall efficiency, there is the advantage of the power of the method of zero crossing. 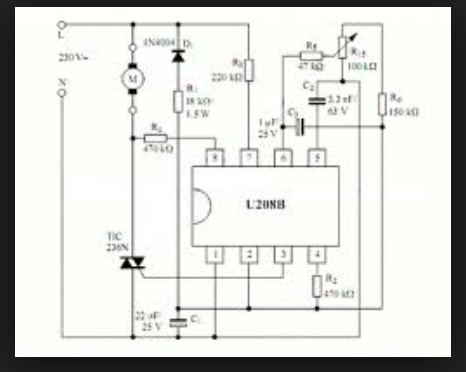 This control circuit is adapted phase for heating the filaments, brushed AC motor, or incandescent lamps. U208B acts as a phase control circuit in bipolar technology with monitoring of the power supply internally. Uncontrolled output pulses avoided by internal controls, tension builds. Further more, it has the sync voltage and internal power. It is strongly recommended as an inexpensive control in open loop.